Words by Dorothy Law Nolte PhD. Image and layout by Holly Maxwell Boydell. Prepared and posted onto The White Space’s page in January 2015 at http://www.facebook.com/thewhitespace. The adults running the world right now, are the children of yesterday. The children of today are the adults of tomorrow. They will run our world – the way we taught them. What we learnt and absorbed as children, is being played out in our lives right now. 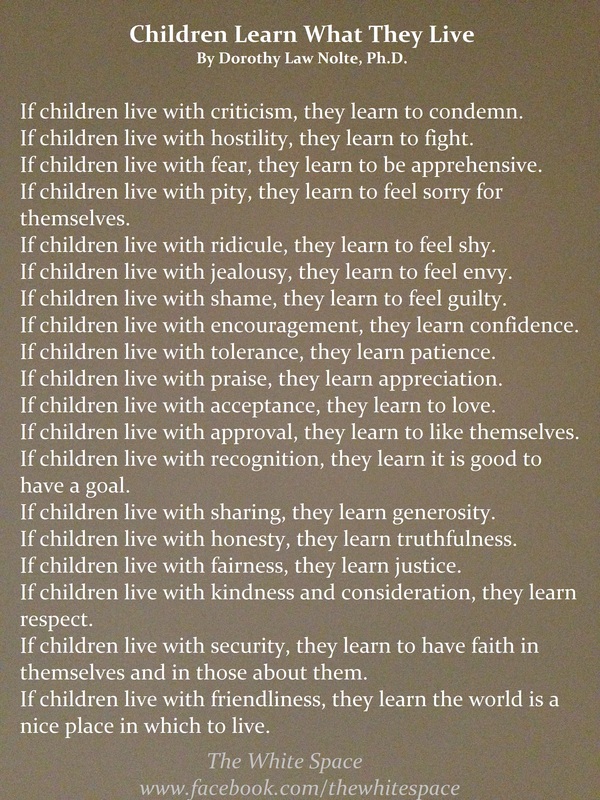 It behoves us all to learn to see the world as children, relearn the lessons, and think before we act. In business, in all professions, in parenting, in all spheres of life. We live what we learnt. We can change.